Sounds ridiculous right? Doing all your study and revision for the UK driving theory test in one single day. Especially if you have just spent the better part of your life studying and revising for various exams. But what if thirty days of study and revision could be compacted into a single day? And then your recall of the material effectively increased thirty-fold? OK, you are nobody’s fool, you are smart and you are streetwise. You did your time and earned your grades burning the midnight oil, sweating through long tortured nights of revising, cramming, worrying, stressing, and procrastinating before finally going into your exams to grind out your grades. So if there is a better way then somebody better damn well show you and prove it because you are sick of studying. Well, by the end of this article the proof and the evidence you need will be laid out before you, leaving you in no doubt that some of the pressures of learning to drive has just been lifted from your shoulders, and that the theory test really CAN be learnt in a day, and without study. Have you ever noticed how easily your brain can abandon you in a high pressure situation? Taking with it the information you worked so hard to learn and retain? The evidence will also leave you in no doubt this system is truly a no brainer, and that you will have almost perfect recall during your theory test after reading 'Pass your theory test in a day. i) Applying for your provisional licence. ii) Deciding who’s material you are going to study with, be that the DVSA’s, the AA’s, the BSM’s, Life Confidents very own Pass Your Theory Test in a Day, or a selection of other offerings. iii) Then there’s the booking of your test. iv) And finally there’s the test itself. So I’m going to simplify the whole process and walk you through from start to finish everything you will need to do and have in place. Step 1. Apply for your Provisional driving licence. One passport size photo Once you have all your ducks in a row you can apply for your provisional driving licence here https://www.gov.uk/apply-first-provisional-driving-licence Or visit your main post office and pick up a D1 driving licence application pack. Step 2. Book driving theory test online. Day 1. Read - Pass Your Theory Test in a Day. This should take about three hours. 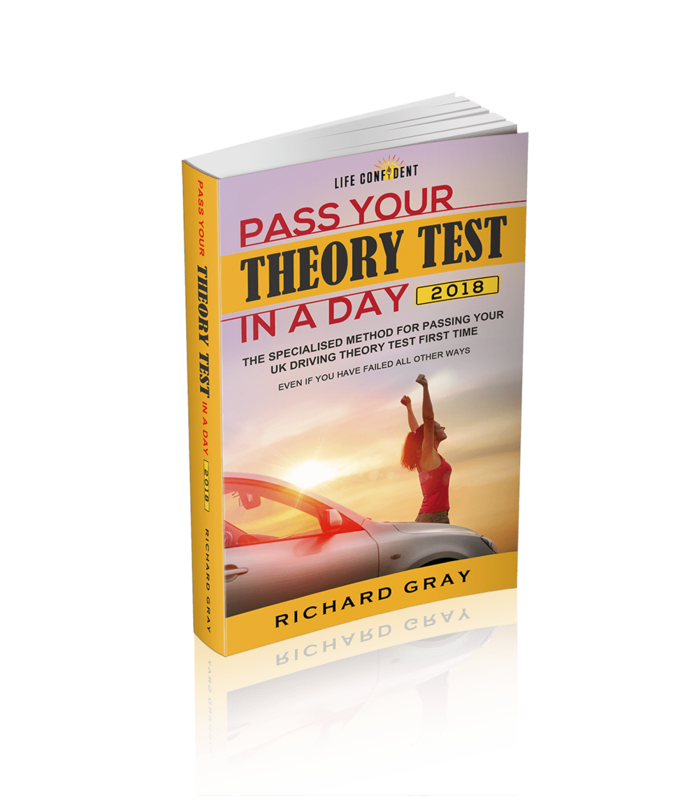 At the end of each chapter a question style summary of all the theory test issues contained within that chapter have been highlighted. It is recommended you breeze straight past these on your first read through. Day 2. Read the Highway Code. We always advise reading the highway code. Day 3. 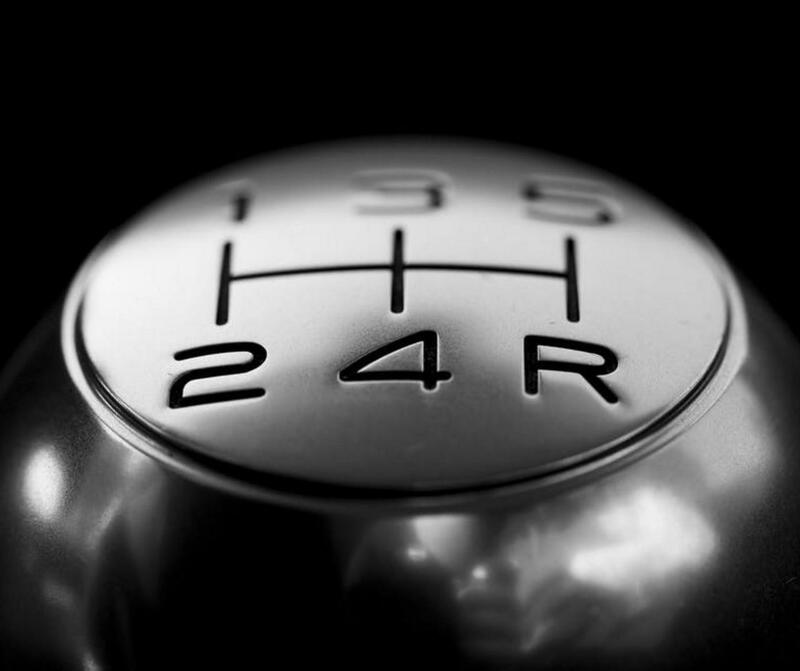 Re-read - Pass Your Theory Test in a Day. While it is possible to pass your test after one day or one read through, this system is so densely packed with information it is well worth reading through again to see if you missed anything first time. To help you with this, now use the revision questions at the end of each chapter to check your ability to recall the scene where the answer appeared. By using the Pass Your Theory Test in a Day system, not only will you be learning the material in record time and without studying, you will also find yourself being able to recall the material long after it would have faded had you used any other method. A bit like how a brilliant and powerful film will stay with you long after you first saw it. So what are we doing differently? Instead of hitting you with reams of multiple choice questions and hoping enough of it sticks before it sends you to sleep, we decided to create the most memorable road race story in history. Each scene within the story revolves around one specific theory test issue and each scene is engineered with memory techniques to implant the information deep in your memory without any conscious effort on your part. What is the stopping distance at 60mph? Imagine for a moment driving down a long straight country road where the national speed limit of 60mph is in force. It is a sunny day with not another car is on the road so you begin to speed, next you hear a bang as something bounces off your roof. The air fills with the citrusy sour scent of lemons then more bangs as lemons begin to bounce off your car. You look around but see no trees until, up ahead, the road starts heaving and chunks of tarmac start flying as a Lemon Tree climbs out from the middle of the road. You hit the brakes in an effort to stop before hitting the Lemon tree which blithely stands there glaring down at you (this is a speed demon). The key word for this scene is Lemon Tree which translates to Seven Three. 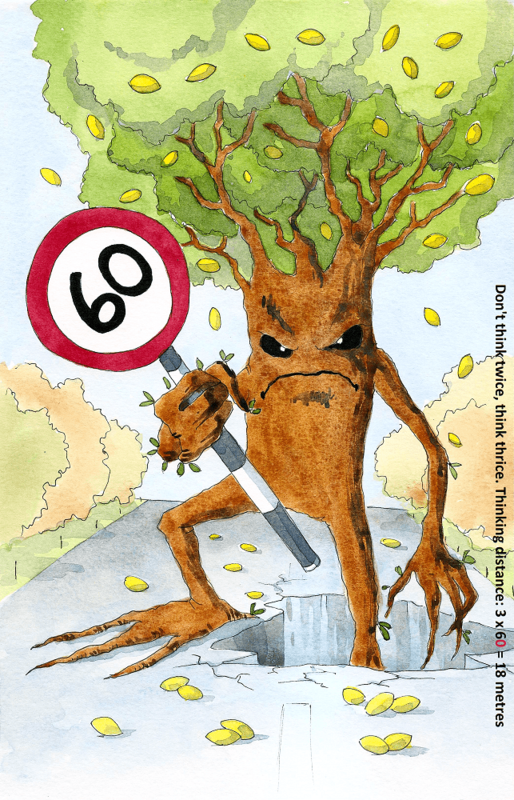 Lemon tree does not rhyme with any other number combination therefore you can now, and for always, remember that the stopping distance at 60mph is 73 metres. This is just one example of one scene using one memory technique. Multiple different memory techniques are used in order to keep from intruding on the conscious mind as it focuses on the storyline. This ensures the learning remains at a subliminal level over the course of more than two hundred scenes culminating in a plot twist you will never see coming. Don’t take Personal belongings. If you do, be prepared to empty your pockets and place any personal items such as phones or notes, anything that could be used for cheating, into a provided locker. Preparation. This includes instructions about how the test works and some sample questions to help you familiarise with the screen layout and operation. Multiple choice questions. (Multiple choice min score requirement: 43 out of a possible 50) You will have 57 minutes to complete 50 multiple choice questions. Some questions will be based on a short story (known as a case study). Any question can be flagged (like flagging an email) so you can easily return to it at the end. If you budget for 1 minute per question this will allow you 7 minutes to revisit any flagged questions. You can also go back and change any completed questions within the allocated time. Cool-down. Between The multiple choice question stage and the hazard perception stage you will be allowed a 3 minute period to cool your brain and calm your racing heart. Preparation. As with the multiple choice questions you will be given a tutorial video to help familiarise you with the hazard perception clips. i) Static hazard – This can be anything from a traffic island to the road itself. It is enough at this stage to just be aware of this class of hazard. ii) A potential hazard – This is anything that is moving or could potentially move such as a pedestrian or a parked car. iii) A developing hazard is anything that was formerly a potential hazard but is now causing you to take some form of evasive action such as changing direction or speed. A developing hazard could be a car door opening on a parked car or a pedestrian moving out to cross the road. For your benefit ‘One day theory test pass’, through our Life Confident Youtube channel, is building up its own database of high definition hazard perception saturation clips with commentary for you to check out. The purpose here is to get you familiar with observing clips with potential hazards so you can learn to identify them and pinpoint the moment they change into a developing hazard. Clips with multiple hazards will be identified, their purpose is to immerse and overwhelm you like learning to swim at the deep end so when it comes to the actual clips in your test you will find yourself amazed and almost laughing at their simplicity and sanitised format as you breeze through them effortlessly. It is a fact that 50% of everyone taking their driving theory test this year will fail. And of those people, the average study and revision period was six months. So if you are destined to fail after six months then suspend your disbelieving, exam fatigued brain and give ‘One Day Theory Test Pass’ one day of your time. The result could be truly astounding and what do you have to lose when the author is telling you his system takes all the responsibility for passing the theory test off your shoulders and places it squarely on his system.